as it helps widen your airways as well as humidifies and fluidizes the bronchial secretions in the bronchial tree, thereby reducing bronchospasm. Salt therapy provides a natural asthma treatment as it absorbs the edema from the mucosa lining the airway passages,with salts natural anti-inflammatory and anti-bacterial properties. 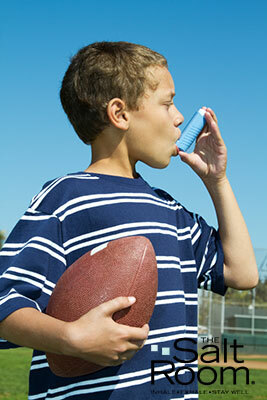 An asthma patient will start breathing easily after just a few sessions. These sessions will also decrease your coughing and your dependence on asthma inhalers and drugs. A complete treatment regiment of 5-15 sessions will provide benefits for as long as 6-12 months. For those clients that want to maintain the benefits of salt therapy with regular use, some of our memberships give unlimited sessions of salt therapy each month.